This summer, the School of Earth and Space Exploration will welcome its first Alberto Enrique Behar Research Professor to the faculty, computer scientist Jnaneshwar Das. The professorship was established by ASU’s president, in memory of Alberto Enrique Behar, who died tragically in 2015 in a plane crash. Behar was a deeply knowledgeable and accomplished researcher working on robotic systems for planetary science, and a true explorer with field experience in the Arctic and Antarctic, on land, in oceans, and with space missions as well. Previous to his appointment at ASU, Behar was an investigation scientist at the Jet Propulsion Laboratory. Prior to joining ASU, Das was a postdoctoral researcher at the General, Robotics, Automation, Sensing and Perception (GRASP) laboratory at the University of Pennsylvania, where he investigated the use of unmanned aerial vehicles (UAVs) for precision agriculture, Earth sciences, and humanitarian applications. Das, who earned his master’s degree and Ph.D. in computer science from the University of Southern California (USC), is also a co-organizer of the National Science Foundation’s Student Cyber-Physical Systems (CPS) Challenge, and the founder of the OpenUAV Project, producing testbeds to support UAV education and research. His research contributions include mixed-initiative spatio-temporal observation of environmental and biological processes, exploiting mathematical models, and algorithms for closing the loop on data-driven robotic sampling. During his doctoral work, he collaborated with USC’s Department of Biological Sciences and the Monterey Bay Aquarium Research Institute (MBARI) on detection, tracking, and sampling of marine blooms with autonomous underwater and surface vehicles. He is particularly interested in principled approaches from Bayesian optimization and optimal stopping theory for opportunistic robotic collection of physical samples of leaf, water, air, and soil for ex-situ analysis. At ASU, Das will be leading teams to develop systems that support and extend Earth and space exploration research. “These systems will help us maintain the pulse on our planet and beyond, through improved observation of topography, land-cover dynamics, volcanoes, underwater habitats, and agricultural farms, while providing insights for generalization of the methods across these diverse application areas,” he says. 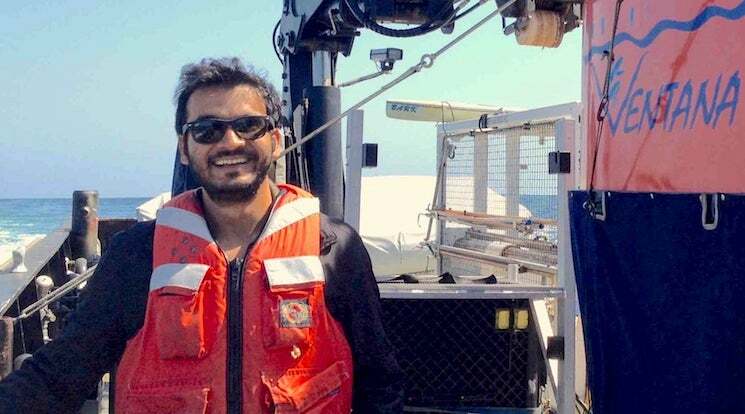 Photo: Jnaneshwar Das aboard R/V Rachel Carson, during a joint field campaign between the University of Southern California and the Monterey Bay Aquarium Research Institute (MBARI) in the Southern California Bight.